British tourists and residents are more likely to need consular assistance in Thailand than anywhere else in the world, according to Michael Hancock, Her Majesty’s Consul at the British Embassy in Bangkok. 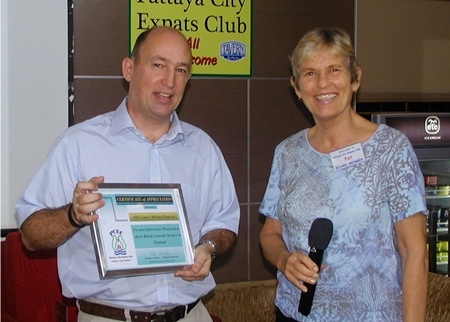 Michael spoke to the Pattaya City Expats Club at their February 10 meeting. He noted that the Embassy estimates that there are about 50,000 Brits residing in Thailand, and that there are about 870,000 visits to Thailand each year by British tourists and residents. The Embassy’s visa section, which is a regional hub, processes about 80,000 visas a year. The embassy in Bangkok is one of Britain’s largest, with 35 UK staff and 110 locally employed staff. (It used to be a 50-50 split.) The Consular Section in the embassy has 25 staff in Bangkok and two in Chiang Mai. The work is supplemented by an honorary and voluntary network made up of Honorary Consuls in several locations in Thailand. Some of these positions, including the one in Pattaya, are currently vacant. The Honorary Consuls provide “first aid” emergency help to people in difficulty where Embassy staff is not present. PCEC Chairman Pat Koester presents Michael with a Certificate of Appreciation, thanking him for his excellent presentation. Michael explained the goals of the British Consular Services, which is to provide British nationals around the world with modern and efficient consular services; one of the three foreign policy priorities of the UK government, the other two being security and prosperity. Michael said that the British Consular Services are both proactive and reactive. Examples of proactive services are educating people about the risks of travel to Thailand before they leave, reminding them to purchase insurance, and letting Thai authorities know about the concerns of British residents and tourists. Examples of reactive services include notarial and documentary services, emergency travel documents, registration of births and deaths, and assistance to British Nationals in difficulty. ‘IT guy’ Richard Smith advises of the upcoming iPhone / iPad / SmartPhone users’ group meeting. MC (& fellow IT guy) Richard Silverberg holds the mike. However, the most important customers are victims of serious crime, prisoners and those involved in serious accidents, incidents and crises – and people who have had a relative die in Thailand. These cases often require face-to-face handling. Michael provided a breakdown of the assistance cases handled by the Consular Services in 2012 which included 340 relating to deaths, 180 to arrest/detention, and 231 to hospitalizations. Of the 180 arrest and detention cases, 35 involved illegal drugs and 61 involved immigration issues. Michael said that there are about 80 British prisoners currently in Thai jails, in 21 different locations. Consular staff visits each prisoner once every eight weeks. Michael noted that the Consular Section used to issue passport renewals, but that this service was discontinued because of the need to cut costs. Globally, 80 passport centres were reduced to eight regional centres, including one in Hong Kong which serves Brits in Thailand. Starting in 2014, Michael said, all passport renewals will be handled directly by London. 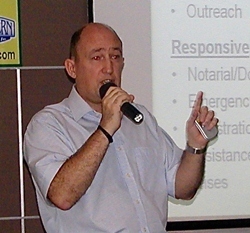 Michael Hancock, Her Majesty’s Consul at the British Embassy in Bangkok, addresses PCEC members and guests on the issues which can arise requiring Brits to seek consular assistance in Thailand; they are more likely to require assistance while visiting Thailand than any other destination in the world, Michael said. The British Embassy previously conducted a survey of retired British nationals. He mentioned that the four largest concerns expressed dealt with exchange rates, frozen state pensions, risk of road accidents, and the need to renew their Thai visa annually. He also commented on the reason for closing the consular office in Pattaya last November, which was the need to cut costs. 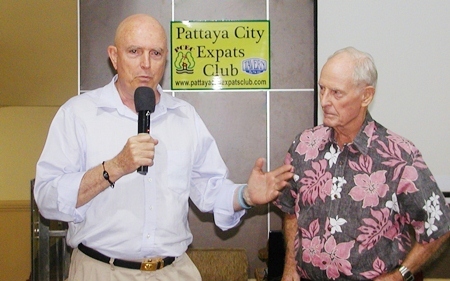 Although the Office is closed, the Embassy is in the process of filling the Honorary Consul position in Pattaya. For consular information, the Embassy Consular staff can be contacted by calling 02-305-8333 or emailing Consular [email protected] Information can also be found on their website: ukinthailand.fco.gov.uk. 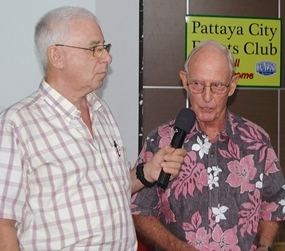 After Michael answered several questions, Master of Ceremonies Richard Silverberg then provided an update on upcoming events and called on Roy Albiston to conduct the Open Forum where questions are asked and answered about Expat living in Thailand; Pattaya in particular. Board Member Richard Smith introduces fellow member Gary Brown, ‘a man who needs no introduction’, at least for older members. Gary is now resident in Florida, but doing a visa run to Thailand as he assists in peace negotiations in the Middle East, particularly between the main religious groups in the area. Let’s hope he packs a cut lunch!